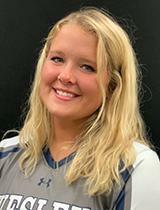 LANCASTER, Pa. – Wesley College freshman hurler Jessica Anderson was tabbed as the Atlantic East Conference Pitcher of the Week for the second time this season on Monday. Anderson won two games in three starts last week, including picking up her first collegiate shutout in a 3-0 victory on Saturday over the Penn St. Abington Lions. She shut down the Lion bats with nine strikeouts and facing three batters over the minimum with a hit batter and two scattered hits in the win. In Anderson's start against Widener on March 19, she had a no-hitter going until the fifth inning. She totaled 18 strikeouts with a 2.07 earned-run average in four appearances and has held opponents to a batting average of .181 for the week. Anderson leads the Atlantic East in strikeouts (60), ranks second in wins (5) and third in ERA (1.87).